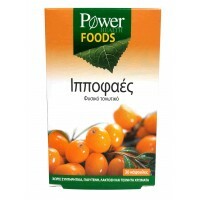 Food supplement with Sea Backthorn. A natural food source of many precious micro-nutrients, like vitamins, minerals, antioxidants, carotenoids, flavonoids, aminoacids, Omega 3,6,7,9 fatty acids. A unique combination for energy, well-being and protection of the body. Ingredients: Sea-Buckthorn (Hippophae Rhamnoides), Gelatin, Water, Tri-calcium phosphate, Magnesium salts of fatty acids. Contains 0,44g carbohydrates per capsule. Without artificial colours, preservatives, gluten and lactose. Directions of use: Adults, take one capsule per day preferably after meal, as a food supplement. Don’t take nutritional supplements during pregnancy or lactation without your doctor’s permission. Don’t exceed the suggested dose.